I believe we had a separate thread for severe weather stuff last year, so figured I would start one for this season. Here's some pics I took from my chase in Kansas on May 1st. Looking like Wed pm will be a good test of 2 things. Whether this season will continue the more active severe trend seen so far and SPC's usefulness in predicting it a few days in advance. I think I'll continue using the monthly threads for severe wx discussion. That's what the point of those are. I'll share whatever pics I get here though. Prolly a good idea really. Not much else to fill the warm season monthly threads..
Those are awesome guys! Beautiful. Jeremy I wish I had as much time on my hands as you. You take spectacular pics that's for sure. Thanks! I'm very lucky. I have a wife that let's me be gone(although I usually get some grief, but she knows this is my passion and what keeps me happy ). I also have a job where I can take off time whenever I want every year. Unfortunately it's a sales job, so it can hurt my final numbers every month. I also have a guy that pays me to take him out chasing. He's a photographer and wants tornado and supercell pictures. I wouldn't have been able to go 3 days in a row last week and to Oklahoma without being paid nicely. Here's a link to his website. He takes AMAZING pictures! Had some severe weather south of me last night. I think Detroit got hammered. My area just received heavy rain w/ some wind. No severe weather IMBY until perhaps early next week. Tbh, I am so looking forward to some real action in terms of t'stms. Went chasing on May 18th down in western Kansas. Tornado chances weren't really high, but it had been a couple weeks with no chases and it looks horrible again for the foreseeable future. My chase partner and I went to near Scott City. Storms took much longer to form than forecast near 6-630. They were moving slowly and we were meandering around on the back roads when we happened to come across Monument Rock. Very cool thing to see in the middle of the Kansas plains. We had a storm forming while there just to our west and again since motion was very slowly to the north we were able to just sit and watch it. It tried spinning something up at the back of the storm, but then fell apart when a storm from the south merged with it. We went after one more storm to our north making it there just before sunset. It had a tornado warning come out shortly thereafter and for a minute or two looked interesting, but it weakened a short time later. Then had to make the 7 hour drive home getting home about 4 in the morning! Had low expectations going in but still ended up with decent pictures. One more picture from last Friday in Kansas. Some severe weather this weekend is possible for my area. MDW looks kinda iffy. Those storms could put a damper on the outdoor activities for those Michiganders. Stuff like that is why I miss living out in the flatlands west of OKC. When I was a kid I could watch storms forever before they got to where I was. That and Gary England are the 2 real reasons I fell in love with weather and now will be in love with it forever. Awesome power. Impressive LP supercell Jeremy, that’s awesome!!! This weekend has the potential for some severe weather in the gl's region. What a pitiful severe weather season thus far. Better hope it picks up in June or we won't have one this year. https://www.weather..../may292008svr Seeing this that the NWS just posted from 10 years ago just rubs it in even worse. I was living in Aurora at the time and we had back to back years with Tornado touchdowns right outside town. 2009 had a monster just west of town. Those two Springs really helped shape my passion for severe weather. Had a cluster of storms coming down from my north last night, but as they did, they dissipated and ended up w zilch. And when I saw them on radar they looked really potent too. Thought you'd get nailed tbh.. Exactly, the most I saw was quick lightning and that was it. Sorry if I’m being dramatic here(and sorry for the language), but I just almost died. Not just like kind of almost, like one second away from dying. Tell everyone you love everyday you love them. You never know when it’s your turn. I'm sure I speak for everyone on here and we're all glad your safe and alive to tell your story. Life is very fragile and moments as such remind us of that. God was watching over you! I chased Memorial Day down in Kansas. The original plan when I left the house was to go to eastern Colorado, but on the way there I took a slight detour to check out the storms that were already in north central Kansas by late morning. I figured those would eventually move on and I could continue to the west. However, they kept redeveloping and strengthening and eventually the SPC put out a tornado watch from these storms onto the west into eastern Colorado. Unfortunately for me this day, I had my car and wasn't in my chase partner's truck so that meant trying to avoid the hail at all costs. I ended up being on the east side of the storms in Kansas along I-70 and was basically stuck there as the storms kept developing and forming over the interstate with large hail. I finally had to make a break for it after almost an hour, and made it through the storms unscathed despite some hail. At this point the landspout fest was on in Colorado and I was still an hour away. However, as I at least initially tried to get to Colorado, I met this fast moving left mover that crossed the highway in front of me. One of the cooler looking storms I've ever seen and it even managed to drop golf ball sized hail in front of me. Looking back, I'm glad I had my car on this trip as that night when i was heading home and had to avoid the frickin SEMI that was in the middle of the interstate, having my little Nissan Altima made it easier to swerve than the big Nissan 4Runner that my chase partner and I normally take. So I missed the landspouts, but lived to see another day. Maybe some t'stm activity IMBY by Sunday. We will see. Now is currently at 40% and scattered in the pm hour. Well, today is Sunday, but no thunderstorm activity expected, at least not in the severe category. Just am rain w pm scattered showers. Cant seem to get a good t'stm in the area. I chased on Friday 6/1 out in central Nebraska. First we went to north central Nebraska where storms were supposed to form first and shortly after arrival near Ainsworth, NE initiation happened about 3p. The idea today was to stay on the tail end of the storms or any discrete storms that could form. We kept dropping south as smaller individual cells would form and either become part of the growing line or would remain pretty weak and not do much. There ended up being a cell near Broken Bow moving northeast that was quite a bit south of the line so every one(there were quite a few chasers out) made a break for that storm. It went severe warned briefly but then weakened. It was about this time where we thought about calling off the chase. Finally though storms began to really strengthen about 7p but were almost immediately forming into a line. We found a field to watch the storms though and the lightning was becoming pretty intense and occasionally there were some areas of rotation showing up within the line as the LLJ ramped up. We had some ping pong ball hail start to fall at our location so we had to bail east out ahead of the line. The lightning was still crazy and there were several strikes that were "out of the blue" way ahead of the storms that seemed to be originating in the anvil of the storm above us. We made it to Ord about 845 and decided to grab a bite to eat before maybe seeing if there would be some decent lightning pic opportunities on the way home. We came back out to our car after stopping at the Casey's in town, and suddenly our phones go off with a tornado warning for Ord! We drove north out of town to try and get a good view and the line of storms now had a pretty pronounced lowering/wall cloud west of town. We took some pics/video and then decided to go back into town and then head southeast out of town on one of the highways. The tornado sirens finally went off in town some 8-10 minutes after the initial warning was issued. I love the eerie sound of hearing the tornado sirens wailing. 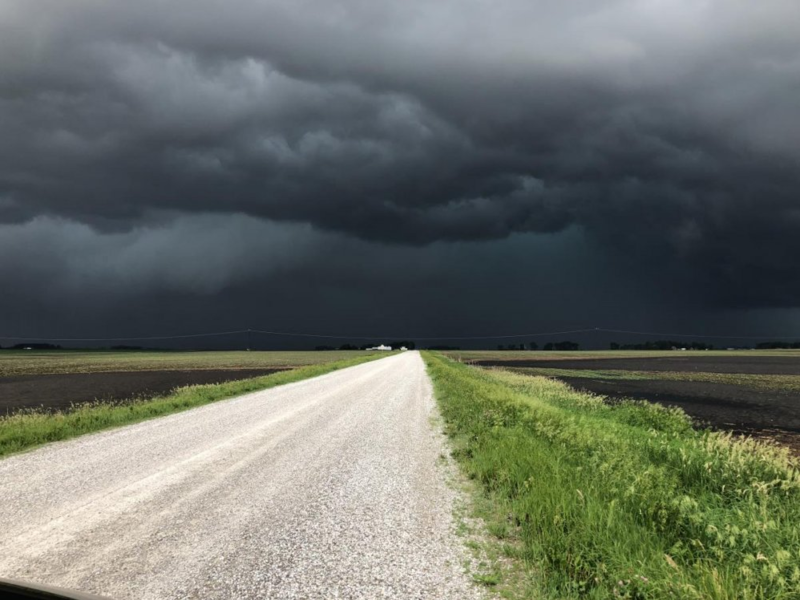 As we were just getting outside of town, suddenly to the north side of the highway we could see a large area of swirling dust underneath a funnel. A tornado was touching down about a mile away from us! We continued to watch it as we drove on the highway(wish I would have snapped a picture or video), but soon it became wrapped in rain. I wasn't sure if anyone had called it in yet so I called 911 and we continued onto the east to get back out ahead of the line. On the way home, the line of storms turned south and caught us from the north with strong winds and blowing dust. It was pretty cool to look to our north over the fields and when the lightning would flash to our north, you could see all the dust being picked up by the wind. Sharing a video of the tornado just east of Ord. This was almost exactly my view/experience with this storm in and near Ord. Not the most impressive tornado, but was nice to see one! Those are absolutely stunning pictures man. Pure beauty. I was bummed the storms were going to remain just west of me and dive south, but there is a very strong cell just wnw of Cedar Rapids clobbering that area with golfball+ hail. I don't want that stuff. No t'stms for my area this week, until maybe next week. absolutely crazy, beautiful tornado out in Wyoming yesterday. Lasted over an hour too. Wow! I think it's crazy how there's literally nothing underneath that storm except the tornado. No rain, nothing. Just awe inspiring. I'm jealous! I don't entirely like severe weather but I sure would like to see a monster like that out there just mowing down the nothingness. Vee, or 11 miles south of Childress, moving southeast at 20 mph. This is a very dangerous storm. HAZARD...80 mph wind gusts and softball size hail. apparently temps were in the low 60s with dews in the 40s when this happened too. Of course it takes a different set of parameters to get tornadoes out there due to elevation, etc. Maybe some storms next week in my area. We will see. So far nothing extreme for this week, in terms of severe weather IMBY. Lets see if that changes as the week progresses. It sure is quiet here considering there are rotating supercells with tornado warnings near Omaha. Not my picture, but thought I’d share it. I’ll work on my pics soon. There’s some debate on what this is- wedge tornado or a low wall cloud. No one seems to want to confirm the tornado from what I’ve seen yet. I was on the next major highway south of this so I saw this feature too but from about 4-5 miles further away. Little late, but this is for June 9th. I initially started in Mason City and bagged a brief bird fart tornado up there, along with a few not picture funnels. Only issue with these storms was that everything was super HP, apparently there were more tornadoes, but I couldn't see them. Then as those storms went outflow dominant, came back to CR for a bit before a storm near Tama storm initiated, then headed back out again. This storm was thankfully more classic in nature and around sunset which made it better. However, that storm was a wall cloud party. Issue was that there were 2 separate surface circulations and both kept spitting out wall clouds and neither became dominant over the other. What we get then is a whole bunch of wall clouds that lack the "umpf" to get it done. All in all, pretty solid chase today, especially for 2018 standards. 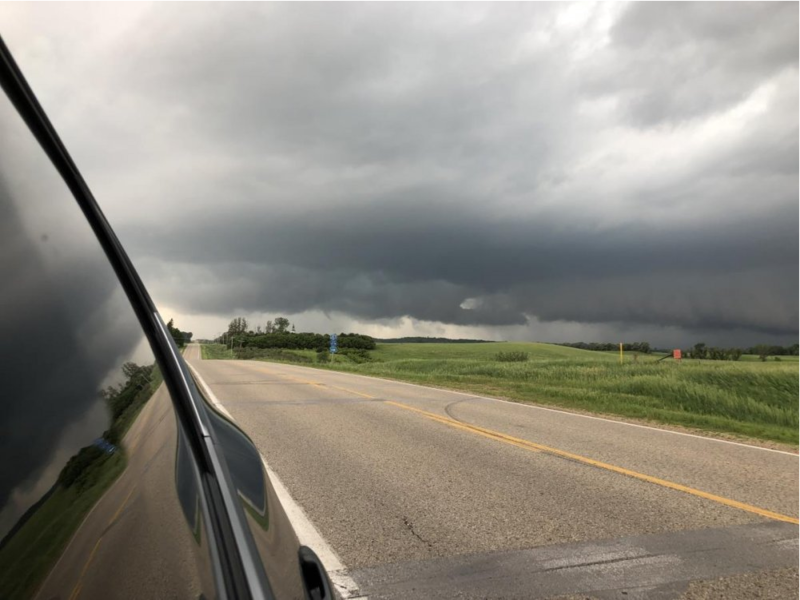 and just one of the MANY wall clouds the storm near Tama/Belle Plaine produced. This storm put out some really well constructed, large wall clouds. However do to having 2 circulations, they just couldn't tighten up. I chased 6/11 in eastern Nebraska. Left Omaha and made my way west of Fremont. A nice cell formed about 5 miles to my west and it was neat to watch it grow from a little cumulus cloud to a severe storm. This storm formed right on the cold front though and I normally don't like storms right on the cold front for tornado potential as the front can undercut them a lot. I watched the storm slowly strengthen and eventually had a precip free base on it's southern end that would occasionally develop a non rotating wall cloud in different spots along the base. I saw the first blips on radar form down by Gretna about 20 miles away and thought that's the storm I am going to go after. It was ahead of the front and by itself. I knew I had some time though as storms wouldn't be moving very fast at all and I was relatively close. Just when I was ready to leave the Fremont storm though it would look a little more interesting with lowerings etc. Finally a much wider base formed and a lowering with an inflow tail started to form. Shortly thereafter a tornado warning was issued. It never looked that great on velocity scans, but definitely looked pretty. Meanwhile the storm near Gretna had really exploded and I started to notice the couplet on the southern end of the storm. I finally pulled myself away from the Fremont storm just as it started to weaken and made my way south. I had to deal with rush hour traffic from the Omaha metro area and heavy rain and by the time I made it down south, the Louisville tornado had lifted. The storm still had clear inflow on it's southern end so I felt I would still try to get around the south side of the storm. A line of storms now formed along the cold front to the west and was catching up pretty rapidly to the cell. I was racing trying to stay ahead of this severe squall line and was able to stop a few times only briefly to try and see into the HP cell. It was tornado warned again and a couple of times I could see a suspicious lowering back in the storm. 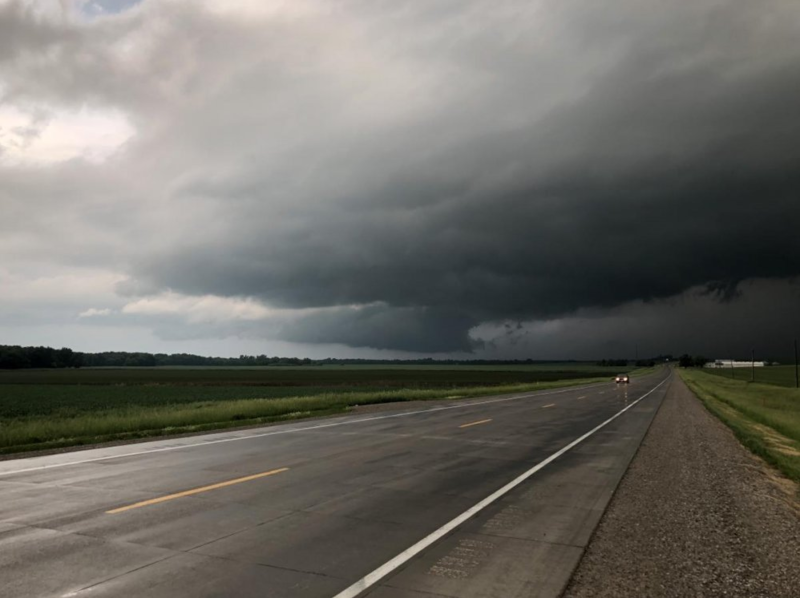 I eventually made it to Nebraska City about 7p and not wanting to get any further from home I found shelter in a car wash as the storms were warned for 80 mph winds now. The storm passed through town with maybe 50-60 mph winds and I headed home. Looking back, I wish I would have bailed south right away as the Louisville storm produced a brief tornado and had amazing structure, but still was able to see some amazing structure with the Fremont storm which was tornado warned as well, and again saw great structure when I did catch up with the storm near Murray. Looks like Saturday I have a chance for seeing some PM storms. Also NWS has so far confirmed 6 tornadoes. All were very brief and weak tornadoes it looks like and apparently that picture of the "wedge" wasn't a tornado, just a very low wall cloud. Severe threat the next few days looks to remain primarily in the Dakotas and Minnesota. I'd like to get some action a little closer to home sometime soon.